After the Great Recession hit in September 2008, many American businesses responded with layoffs. Not so Balsam Brands. “The most pivotal moment that affected the company for me came in early February 2009,” says Balsam’s founder, Thomas “Mac” Harman. 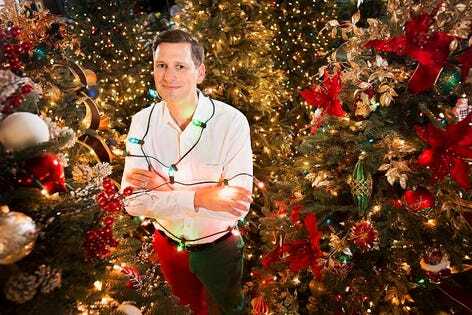 Three years earlier, he had founded Balsam, which sells high-end artificial Christmas trees and decorations from its base in Redwood City, California. The company makes two-thirds of its sales in the six weeks leading up to Christmas and the 2008 season had been brutal. On 2008 revenue of $6.3 million, Balsam had lost $2.1 million. But instead of letting staff go or cutting pay, Harman gathered his seven employees and promised to guarantee their jobs and salaries through the end of the year. A Stanford business school graduate, Harman, 42, had put in two years as a consultant at McKinsey before taking over and then selling his family’s struggling wire-product manufacturing plant in Cleveland after his father died suddenly of lung cancer at age 59. He got the idea to sell artificial trees after paying a holiday visit to his Korean-immigrant in-laws in Beaver, Pennsylvania and recoiling at their “sad, cheapo” fake tree. With a little research, he learned that among the 100 million U.S. households that put up Christmas trees, 81% have fake ones. While 90% of the $1.2 billion artificial-tree market is captured by mass retailers like Wal-Mart and Home Depot, he saw room for an upscale product. At the height of the recession, how did Harman know Balsam would pull through? “I had naïve founder confidence,” he says. He also believed in his signature product, lifelike fake trees he designed himself based on real tree varieties like Norway Spruce. Instead of less expensive faux trees whose greenery is made of shredded plastic, Balsam trees have polyethylene spikes that surround hand-painted plastic stems. Most models can fold into a bag for storage. One of its most popular, a 7.5-foot Noble Fir with LED lights, sells for $1,249. In his first year, working alone, he had logged $2.9 million in sales and Balsam was profitable. The following year he spent hundreds of thousands of dollars on marketing experiments like running print ads in the New York Times, sending his balance sheet into the red. Year three was supposed to be Balsam’s turnaround. But even though the 2008 losses were a blow, sales didn’t plummet as much as he had feared, dropping $200,000 from revenue of $6.5 million in 2007. Read more about Balsam Brands here.